We’re all about prefab homes for humans, but cats need shelter too! Luckily, there’s Caboodle – a corrugated cardboard modular condo that your feline friends will be delighted to move their little cat possessions into immediately. Aside from having architectural details that are the cat’s meow, Caboodle’s are also made in the good old United States from 40% post-consumer recycled cardboard. We're all about prefab homes for humans, but cats need shelter too! 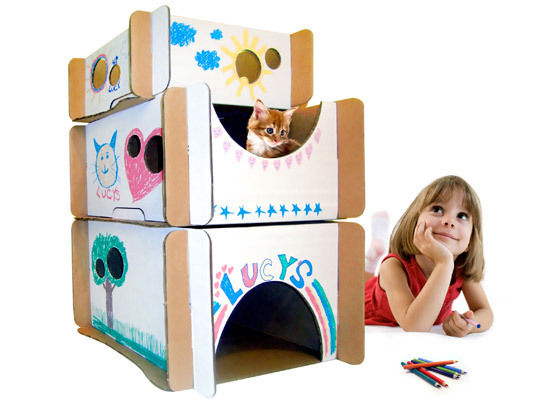 Luckily, there's Caboodle - a corrugated cardboard modular condo that your feline friends will be delighted to move their little cat possessions into immediately. Aside from having architectural details that are the cat's meow, Caboodle's are also made in the good old United States from 40% post-consumer recycled cardboard.